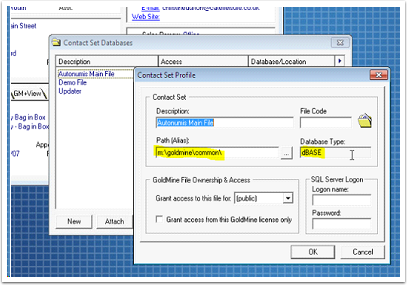 This page will guide you through configuration and basic use of the Level365 CRM Connect GoldMine Add-in. It is expected that you are already familiar with the Address Book, Call History and Preview window, and the basic concepts of integration and screen popping using the Add-ins. GoldMine and the database used to store your contact data should already be installed and working normally before proceeding with this integration. 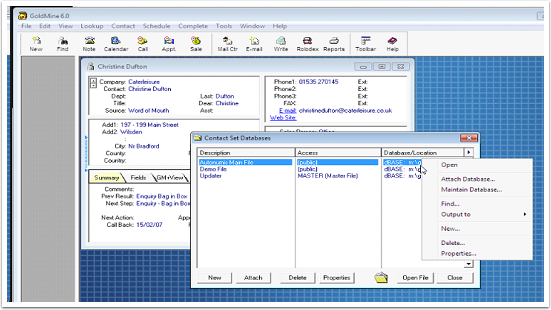 Right-click the Level365 CRM Connect tray icon in the system tray menu and then left-click the Configuration option from the menu that pops up, this will open the 'Configuration' screen. In the 'Integration' area, click the Add new button, select GoldMine from the 'Type' dropdown box and then click the Set button. 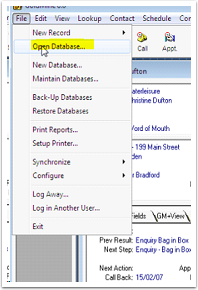 To gather the required information about your database, go into GoldMine, click the File menu, then Open Databases. Click on the database you wish to use in the integration. Then select properties and under 'Path (alias)' you will find the file location required and next to it under Database Type you will see what 'Database Type' you are using, in this case it is dBASE. Back on Go Connect's 'Configuration' group, type the 'Host' information into the 'Server' dropdown box or, if one of the existing options in there is exactly the same as the 'Host' information, you can click it. Do the same with the 'Database' information from GoldMine in the 'Database' dropdown box instead. Under most circumstances, you'll be able to select the 'Windows authentication' option without the need for any further information. 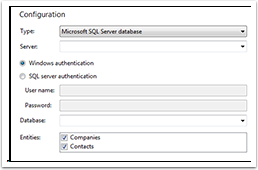 However, depending on your database's security policies, you may need to select the 'SQL server authentication' option and enter specific user name and password, provided by your system administrator. Select which of your GoldMine account contact types you want to be used by checking the corresponding boxes in the 'Entities' section. To test if the configuration worked, enter a phone number from your GoldMine account into the 'Telephone' box in the 'Integration test' area and click the 'Search' button. The results will be displayed after a few seconds.